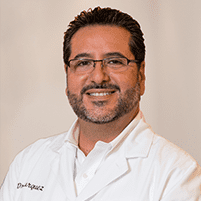 Dr. Burquez understands the critical role your smile plays in the way you feel about yourself, and he is dedicated to using the most advanced cosmetic dentistry techniques to help patients from Chula Vista and Bonita, CA, look and feel their best. Cosmetic dentistry is the area of dentistry that's focused on treatments designed to make your teeth and your smile look their best. Some examples of cosmetic dentistry procedures include teeth whitening, crowns, bridges, implants, dentures, Invisalign® and other orthodontics, and other treatments to correct aesthetic issues like broken, chipped, stained or poorly aligned teeth. Treatments are also available to reduce the appearance of a “gummy” or “toothy” smile, restoring ideal proportions to teeth and gums. A smile makeover refers to a comprehensive approach aimed at addressing multiple cosmetic issues in a carefully planned sequence of treatments based on each patient's unique needs. While some patients can achieve their goals with one or two treatments or procedures, like teeth whitening or a crown to cover a badly discolored tooth, other patients may have additional issues they'd like corrected. A smile makeover ensures multiple procedures are performed in the most ideal manner and sequence for optimal results and a great-looking smile. Are cosmetic dentistry procedures covered by dental insurance? Procedures that are purely cosmetic, such as teeth whitening or replacing sound dark fillings with tooth-colored fillings, are not covered by dental insurance. However, procedures that include a restorative component, such as repair or broken or cracked teeth, are usually covered at least partially. You can as your plan administrator about your specific benefits or let our office staff determine your coverage on your behalf. In addition, our staff can help you find financing options to help you fit your cosmetic procedures into your budget. How can I tell which treatments will help me have a better-looking smile?